Picked this little beauty up yesterday and loved the 4hr journey home ... my first cat and biggest spend ever!! Where abouts in the South West are you, several of us in Dorset. Welcome to the club! Good choice of wheels, too. I suggest you put your vehicle details in your signature, so if you ask for help we'll know immediately what we're helping with. Welcome on the forum ! The car looks stunning, ánd a V8.. .. you lucky man.. Normally I am not a fan of black cars, mostly for safety reason [invisible in darker weather], and you see every spec of dust on them..
By it looks georgous I must say !!! I think we all would love to see some lower intensity light picetures of grazing light, complementing the curves af the beast..
Strangely, from this angle the 'rear quarter' looks more curvy then otherwise with a cabrio.. 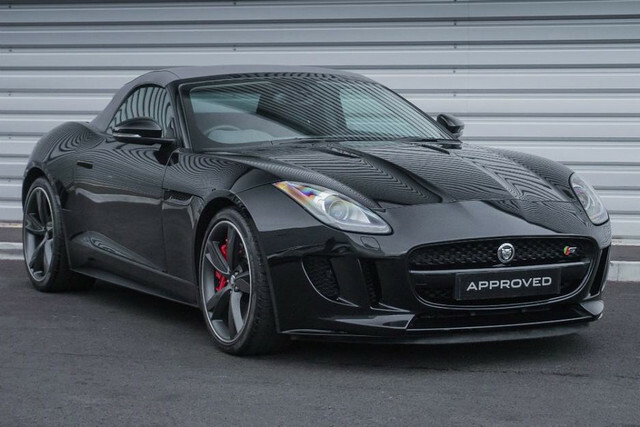 Welcome to the F-Type forums Ade. You have the creme of the crop... There weren't that many V8S's made, and shamefully RWD got stamped on a few years later. First one I've seen in Black with a grey hood...not an obvious choice to me; Really eye catching though. Look f or ward to meeting you... I'm from Dorset as is Rob^..